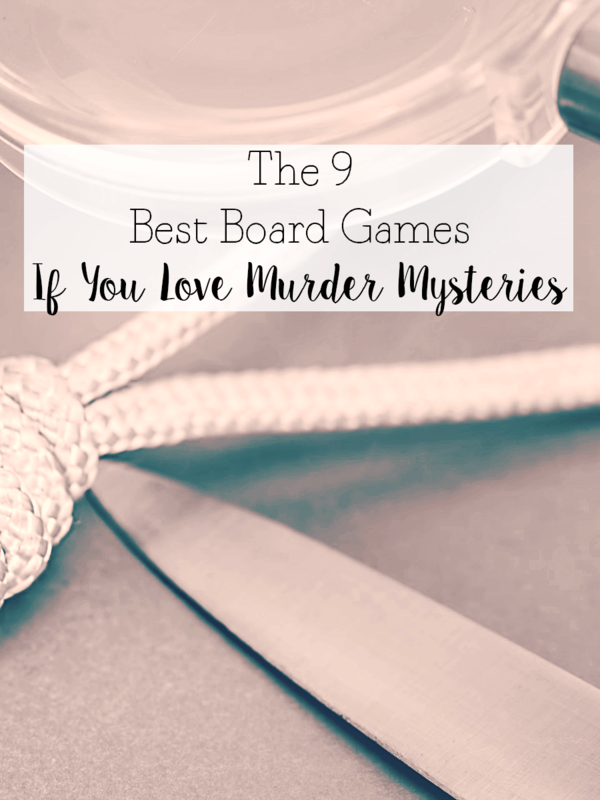 If you need some board games to scratch the murder mystery itch for you, check out this list of my favorite board games if you love murder mysteries. Is anyone else into murder mysteries more than they probably should be? I discovered the genre when I was a kid, going through some of my mom’s library books. There was this one about a woman who ran a baking show, but also solved murders in her free time (or that’s how I remember it. It’s been, like, 20 years since I read this book. And if anyone could tell me what series that is, I would be grateful). After that, I got into Janet Evanovich. And then Harry Potter came out and that encapsulated my whole life. But murder mysteries have always been a favorite of mine. These days it usually takes the form of TV shows like Bones, or true crime documentaries like H.H. Holmes: America’s First Serial Killer. Though I’ve also gotten into podcasts (any fans of My Favorite Murder out there?). 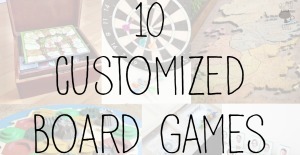 And then I discovered board games. Murder mystery board games. And I’m not talking about Clue. I’ve always wanted to go to a murder mystery dinner, but I can never seem to find one. 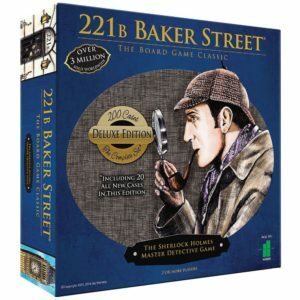 This genre of board game manages to scratch that murder mystery itch for me. They’re so fun to play, and many of them are cooperative. So let’s talk about my favorites! This is first on my list, even though it shouldn’t be because I am so excited about this game. After years of waiting, it finally exists! 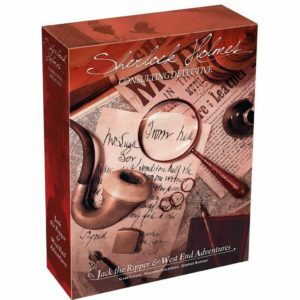 The reason it shouldn’t be first is that it’s a standalone expansion for Sherlock Holmes: Consulting Detective (which is also on this list). 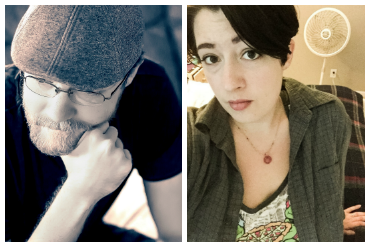 In both games, you’re solving mysteries cooperatively. But “standalone” means you don’t have to play the original game in order to understand this one. So let’s roll with it. 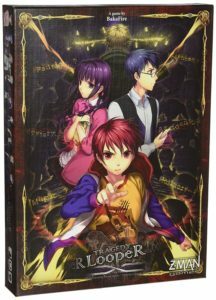 This is a cooperative game where you and your companions are trying to solve mysteries and figure out who Jack the Ripper is. 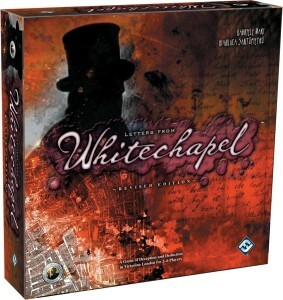 As someone with a long-time obsession with Jack the Ripper (more on that later), I was so psyched when I heard this expansion was being developed. I haven’t played it yet. Don’t worry, I’ve played everything else on this list. But you all needed to know this game is out there and it looks amazing. As previously mentioned, this is the predecessor to Jack the Ripper and West End Adventures. It is one of the first “legacy” type games I ever played, in that once you play it, you can’t play it again. Unless you have a really short memory, anyway. A lot of people aren’t into games like that. When I first heard about them, I thought, “What a rip off! You pay how much for a game you can only play once?” But no. This style of game has quickly become a favorite of mine. According to the box, it plays 8 people. But you can actually play with as many as you want. 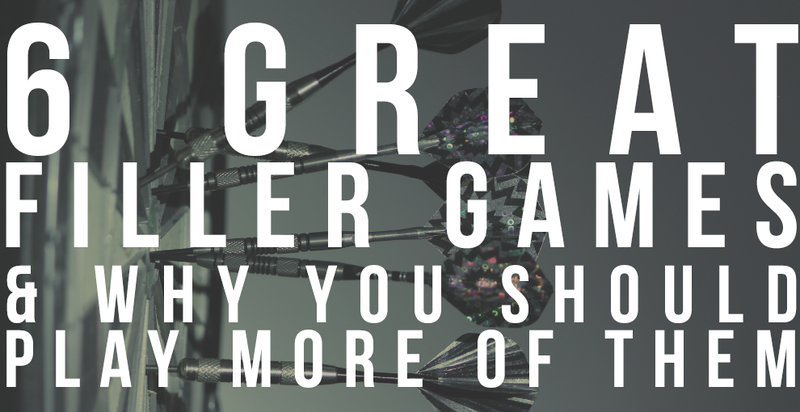 If you can get a lot of people into the game, then it’s better with more brains. Personally, I have trouble finding people who can pay attention long enough to get into it. Some people are too easily bored by the storytelling nature of this game (one guy fell asleep on us once). In our group, we make someone the book reader, someone the newspaper reader, and someone the note-taker. But there are other things for people to do (like figuring out locations on the map or solving complicated puzzles). Which is why I recommend about 5. This way, you can sort of give everyone a job. It works as an incentive for them to pay attention. 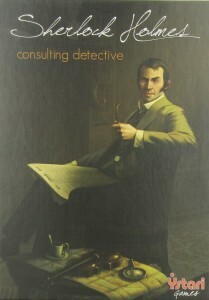 This is pretty much exactly like Jack the Ripper and Sherlock Holmes: Consulting Detective. But it takes place in H.P. Lovecraft’s world of terror: Arkham! There are many mysteries surrounding the town, and it’s up to you to solve them and keep cultists from awakening one of the Elder Gods and destroying the world. 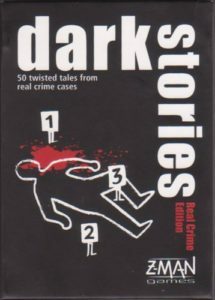 The reason it’s on the list is that most of the cases revolve around solving murders or missing persons cases. 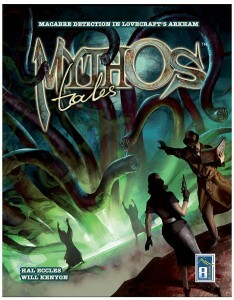 If you’re a fan of Lovecraft, you’re going to love this game. The atmosphere of the game screams “horror” and there were some moments where I was legitimately afraid to continue down a certain path. Because, unlike other consulting detective games, this game has consequences. This is the first semi-cooperative game on the list. It’s a hidden identity game. Someone at your table is a murderer and you have to figure out who it is! Everyone in the group has a set of blue cards and a set of red cards that everyone else can see. One person is the Murderer. They pick a red card and a blue card sitting in front of them (for the murder weapon and the key evidence). The part that always screws people up is they think the murderer can pick ANY blue or red card at the table. But no, you can only pick from your own cards. One person is the Forensic Scientist. They know who the murderer is, but they are not allowed to speak. They have to give clues based on cards. Those clues direct the rest of the team (Investigators) to the murder weapon and key evidence (and, therefore, the killer). You can choose to play with the Accomplice, as well. The Accomplice knows who the murderer is and is trying to deflect accusations away from them. There’s also an Eye Witness, but we played with it once and hated it. The Investigators will try to figure out who among them is a liar (and murderer), and try to determine what the murder weapon and key evidence are. The hard part of this game is that you have to guess both at the same time. If you figure out what the murder weapon is, but you’re wrong about the key evidence, the Forensic Scientist will just say, “That is incorrect” and cannot tell you if you got any part of it right. This is one of my all-time favorite murder mystery games. You’re playing a group of psychics. The ghost of a person who was murdered at a Halloween party one year ago has been sending you visions in dreams. Like Clue, you have to find the killer, the room, and the object, but in that order. To do this, the person playing the ghost (who is not allowed to speak), will give you cards. The cards are gorgeous. The artwork is a lot like Dixit (and, in fact, people often use Dixit cards to play this game). They can give you as many cards as they want to try and help you figure out your person, place, and thing. The difficult part is seeing what they see. You don’t just look at the cards and know, you have to interpret their meaning. Just as the psychic would have to interpret their dreams. Each person will have their own, different person, place, and thing (but you are encouraged to help each other). Because the first part of the game is figuring out who was at the party. From there, the ghost will give you clues to figure out which party-goer murdered them. 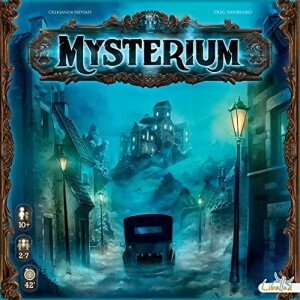 It’s a great game and a lot of fun whether you play the ghost or the psychic. And it’s just downright pretty. This game is as close to Clue as you’re going to get, but it is WAY harder. So if you’re a fan of Clue, you may want to pick this up. In our game group, it gets mixed reviews. Zach HATES it. I like it, but only if I can play with only one or two other people. See, it’s competitive. You’re trying to solve the mystery before anyone else. But there’s only one clue book, and some of the clues are LONG. We wind up with a line of people waiting to see the damn book, which makes the game last way longer than it needs to. If you can get your hands on multiple copies of the book, that would fix the biggest issue with the game. But the mysteries are fun and REALLY difficult. After publishing this, a friend of mine let me know that he found a game called Watson and Holmes at MomoCon. Apparently, it’s a WAY better version of 221B Baker Street. I haven’t played it yet, but check it out! This is one of the very first murder mystery games (not Clue) I ever played and it has remained a strong contender. This game is so cool, and so difficult to win. I love it! figuring out where your home is. This game takes a lot of strategizing. The other players try to find Jack by going to the body and trying to figure out where he went from there. They have 4 nights to figure out where Jack is or Jack wins! I love this game and would play it every week if I could get people to. But it’s also a bit draining because it’s just so intense. This is a bit of an odd game, but it’s still fun. You’re agents who are traveling back in time to stop certain events from happening. Normally, someone’s murder is at the center of this game. You have so many chances (determined before the game starts) to stop the murder and keep other events from triggering. Each time you fail to stop them, you loop back in time and start the day over again. 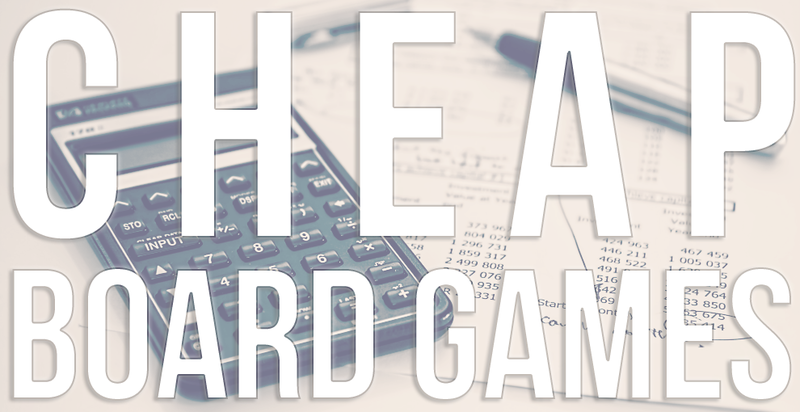 Each character in the game plays a role and those roles are determined by the scenario chosen by the Game Master. Part of your goal as an agent is to figure out which scenario the Game Master has chosen, and which characters belong to which roles. 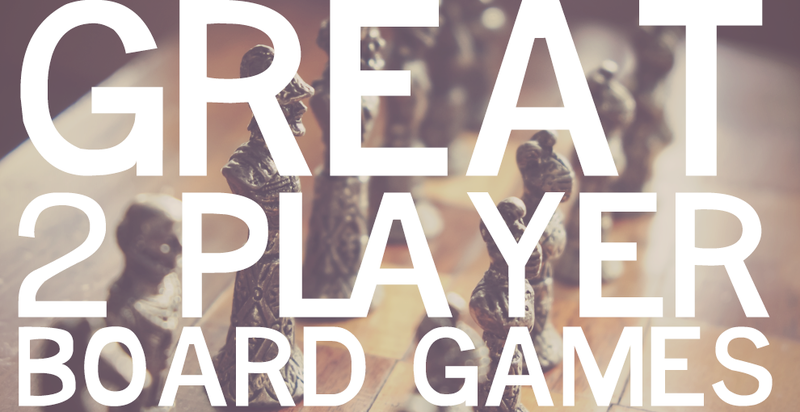 If you’re playing with an experienced Game Master, prepare for a beast of a game. One person reads the mystery out loud and then silently reads the answer. Everyone else has to ask “yes” or “no” questions to figure out how the murder happened. That is literally it. 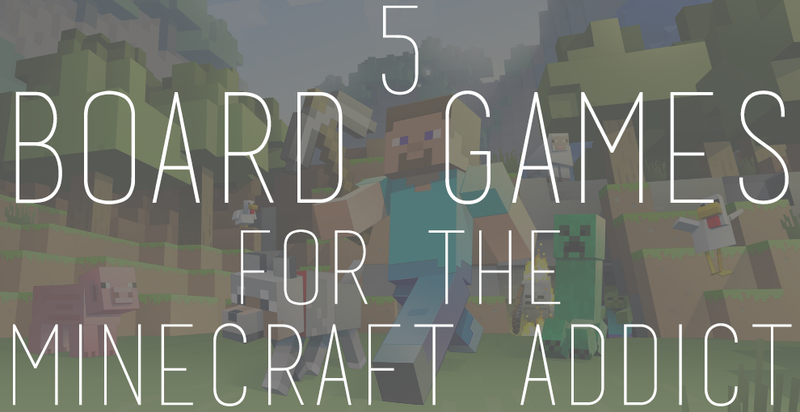 It’s an incredibly simple game and is pocket-sized, so you can take it anywhere. It sounds boring, but it’s actually a great filler game if you need something quick or simple to pass the time. Many of these games made a previous appearance in my 13 Horror Games for Halloween. But for this, I wanted to concentrate solely on who-done-it/hidden identity murders. Is there anything you think I missed? 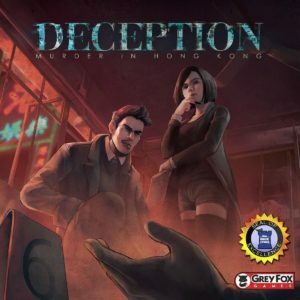 What are some great murder mystery board games that have passed under my radar? Let me know in the comments! 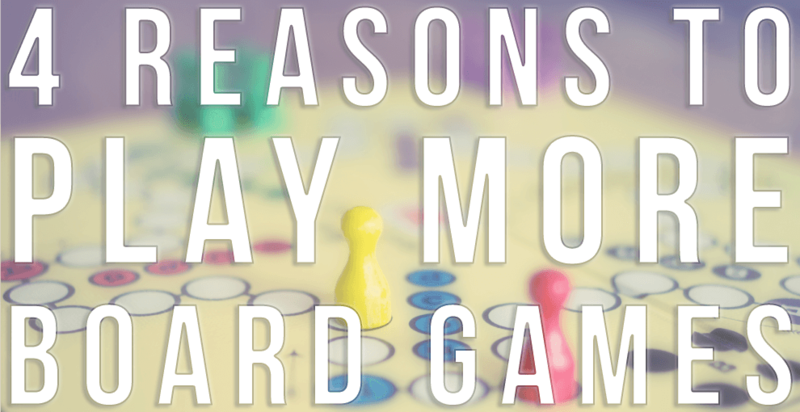 Do you love board games? Do you want to read more about them? Sign up for our mailing list!